Soil is fundamentally a multi-phase material – consisting of solid particles, water and air. In soil mechanics and geotechnical engineering it is widely treated as an elastic, elastoplastic or visco-elastoplastic material, and consequently regarded as a continuum body. However, this book explores an alternative approach, considering soil as a multi-phase and discrete material and applying basic Newtonian mechanics rather than analytical mechanics. It applies microscopic models to the solid phase and fluid phases, and then introduces probability theory and statistics to derive average physical quantities which correspond to the soil‘s macroscopic physical properties such as void ratio and water content. This book is particularly focused on the mechanical behaviour of dry, partially saturated and full saturated sandy soil, as much of the physicochemical microscopic characteristic of clayey soil is still not clear. It explores the inter-particle forces at the point of contact of soil particles and the resultant inter-particle stresses, instead of the total stress and effective stress which are studied in mainstream soil mechanics. Deformation and strength behaviour, soil-water characteristic curves, and permeability coefficients of water and air are then derived simply from grain size distribution, soil particle density, void ratio and water content. A useful reference for consultants, professional engineers, researchers and public sector organisations involved in unsaturated soil tests. Advanced undergraduate and postgraduate students on Unsaturated Soil Mechanics courses will also find it a valuable text to study. 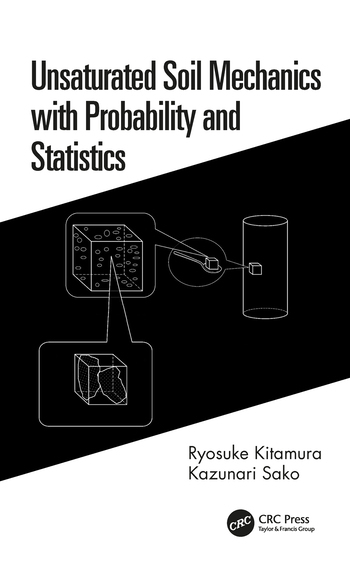 Ryosuke Kitamura is an emeritus professor at Kagoshima University, Japan. He is a recipient of the 1983 Outstanding Paper Award for Young Researchers of the Japanese Geotechnical Society, the 2003 Outstanding Paper Award of Japan Society of Civil Engineers and JGS Medal for Merit for 2004; and has served as a chairman or member of several technical committees of JSCE and JGS. Kazunari Sako is currently an associate professor of Kagoshima University, Japan. He is a recipient of the 2009 Outstanding Paper Award for Young Researchers of JGE. He serves an editorial member of Japanese Geotechnical Journal, Soils and Foundations, and the Journal of the Japanese Society of Civil Engineering.